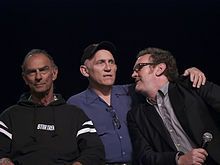 According to co-creator Berman, he and Piller considered setting the new series on a colony planet, but they felt a space station would appeal more to viewers, and would save the money required for a land-based show's on-location shooting. They did not want the show set aboard a starship because Star Trek: The Next Generation was still in production, and in Berman's words, it "seemed ridiculous to have two shows���two casts of characters—that were off going where no man has gone before." ^ a b c "'Star Trek: Deep Space Nine' — The 20 Greatest Episodes". The Hollywood Reporter. Retrieved 2019-04-08. ^ "eBooks - Star Trek: Deep Space Nine: Unity by S. D. Perry - eReader.com". 2008-01-04. Archived from the original on 2008-01-04. Retrieved 2017-06-29. ^ "Star Trek Deep Space Nine - The Complete Sixth Season: Avery Brooks, Rene Auberjonois, Cirroc Lofton, Alexander Siddig, Colm Meaney, Nana Visitor, Armin Shimerman, Terry Farrell, Michael Dorn, Mark Allen Shepherd, Randy James, Robert Ford, Allan Eastman, Allan Kroeker, Anson Williams, David Livingston, JesÃºs Salvador TreviÃ±o, LeVar Burton: Movies & TV". Amazon.com. Retrieved 2017-06-29. ^ Miller, Liz Shannon; Miller, Liz Shannon (2018-04-18). "The 18 Best Sci-Fi TV Shows Set In Space, Ranked". IndieWire. Retrieved 2019-02-27. ^ "J. Michael Straczynski post". Jmsnews.com. 1994-12-07. Retrieved 2010-11-07. ^ "J. Michael Straczynski commenting on B5's attempted sale to Paramount + B5/DS9 similarities". Jmsnews.com. 1996-01-13. Retrieved 2010-11-07. ^ "J. Michael Straczynski post from 1992". The J. Michael Straczynski Message Archive (jms.com). February 4, 1992. Retrieved 2009-10-26. ^ a b "B5 information from GEnie". National Technical University of Athens. Retrieved 6 July 2016. ^ Young, Blaine (22 November 2003). "Star Trek: Deep Space Nine". Blam Entertainment Group. Retrieved 31 January 2015.